Big number, Big Volumes, Big number and Big party mood. Each year a different coffee variety from a different country is used and the figs are handled in a slightly different way. This is of 8% ABV, the beer is 50 IBU things, and that makes 240 calories a serving size, the 750ml bottle contains 4.73 standard drink units. It’s been a while coming. The Epicurean series is a celebration of the flavours and aromas that can be found within the diverse range of ingredients that brewers and chefs alike use in their creations. This beer is a culmination of hours of cerebration, experimentation, cogitation and libation. And a sprinkling of dehydrated finesse. Apart from an early night what cold possibly go wrong? This has a really dry note, by which I mean powdery, on the aroma, which is not surprisingly coffee but also chocolate. Pour is fantastic, black as coffee and with a generous head that settles slightly to something more manageable. Aroma settles into something more ‘ash’ like in some ay that I’m poorly communicating, and the coffee note is present and subtle. And it drinks like a bit of liquid velvet, so smooth and clean, it’s almost cream like in it’s mouthfeel. The bitterness is low and noticeable at the finish, which isn’t dry, and there is a lovely linger. The coffee is more pronounced at he back too, the front dominated by a lovely wall of soft sweetness. It’s almost like I’m writing a love letter. No hints of any ‘fruits’ nor is there a hint of the alcohol in this. For all that though I don’t get any popping of favours, no bright notes. The coffee is nice but it might not be coffee enough, it doesn’t add a bitterness nor a burnt note in there. I also though that the flavour profile was a bit flat in the middle, starts nice with the fullness of taste, and ends well with the coffee and the final bitter but there seems to be a gap in the middle somewhere. AS if it’s not ‘thick’ enough. I’m not overly upset or disappointed though, I had this on tap on release date a moon or two ago and have been dying to try it in the bottle, which has been sitting in the cool dark place for a moon or two. Then of course I re-read what I’ve noted so far, which starts really well, gets a bit iffy and ends a bit meh. I’m not sure that’s correct though. It really is a pleasing mouthfeel, the fullness, bit this has tailed off a bit as it warmed. I wanted more body and another note in there somewhere. All based on the fact that I’ve talked myself into thinking this was made with tears of a angel. Which it might be, but isn’t. It is a pretty smelling beer. Does that count? The pdubyah-o-meter rates this 8 arbitrary things of its things from the thing. 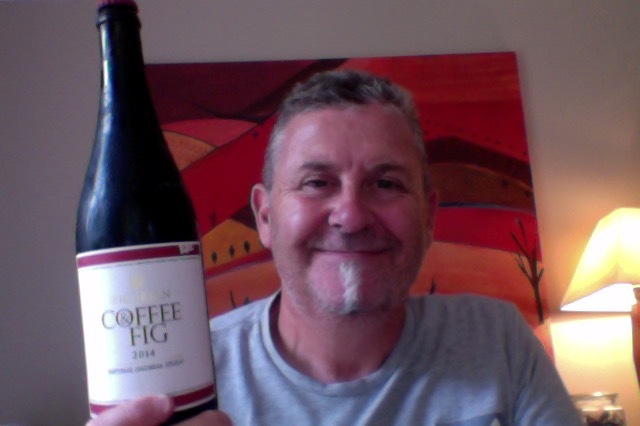 It is a smooth, easy drinking beer, with aroma of coffee and chocolate that delivers a lovely mouthfeel a bitter but not dry finish and a satisfying linger in the mouth that brings a smile. From the amount I’ve managed to drink I’d suggest it is easy drinking, but I’m cautioned by the higher ABV so I’m trying to be good. In the end though I became a bit bored. And that is never a good thing. Am I enjoying it? I started off all enthusiastic and peaked early from whence it was downhill. Would I share with a friend on a porch and set the world to rights? I’d be happy if this was a gateway to other beers I’d hat to finish with this though, bring one over I’d still give you a hug. It’s a full experience music style all at a similar volume, listen you’ll get it. Previously I’ve drunk the 2011 – a 9 on the pdubyah-o-meter, and the 2013 – a 9 on the pdubyah-o-meter, and obviously I missed a trick in 2012. 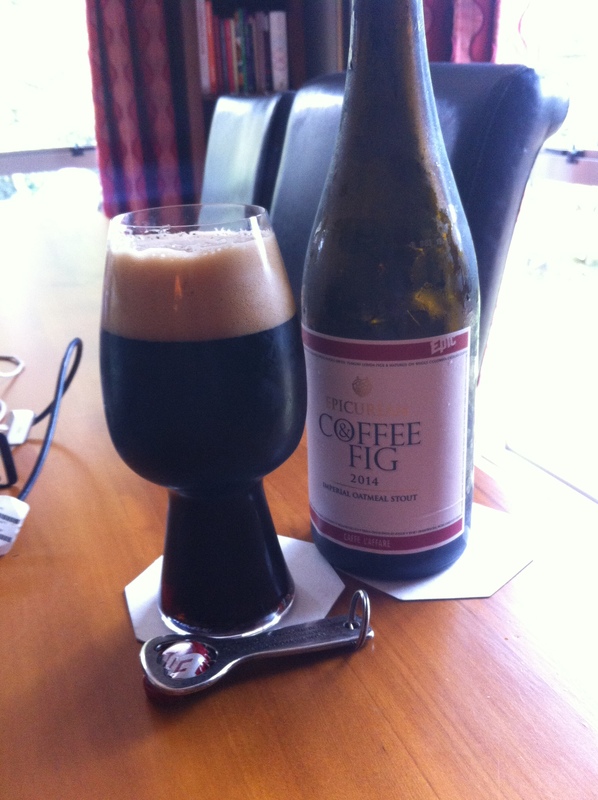 This entry was posted on February 21, 2015 by Philip Walter in Beer, Beer of New Zealand, Beer Review, Craft Beer, Critic, Epic, Imperial Stout and tagged Beer, Coffee and Fig Oatmeal Stout, craft beer, Epic Beer, Stout.